I just finished up the code to work with this simple IR remote. The output of the sensor is connected to PB0. It uses pin change interrupt and determines the length of time the signal is held low, which represents the 1's and 0's. 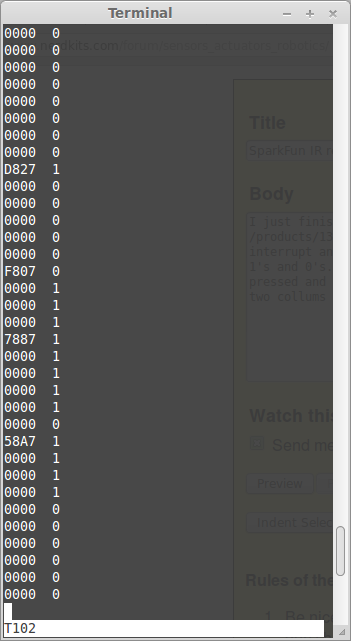 Currently all it dose is print to the uart the code of the last button pressed and if the button is held down. Hey scootergarrett, thanks a lot for sharing your project. I have bought this IR-Kit too, some time ago. I played a Little with my arduino and this kit. I was able to use the remote control to turn a LED on and off. Like it is showed in the tutorial. But I was never able to record a IR Signal from my TV remote, for turning the TV on or off with the Arduino. Did you had luck with that? Maybe I shall give it another try. And try to use it on my Nerdkit. Do you have some Pictures of your project you can share with us?